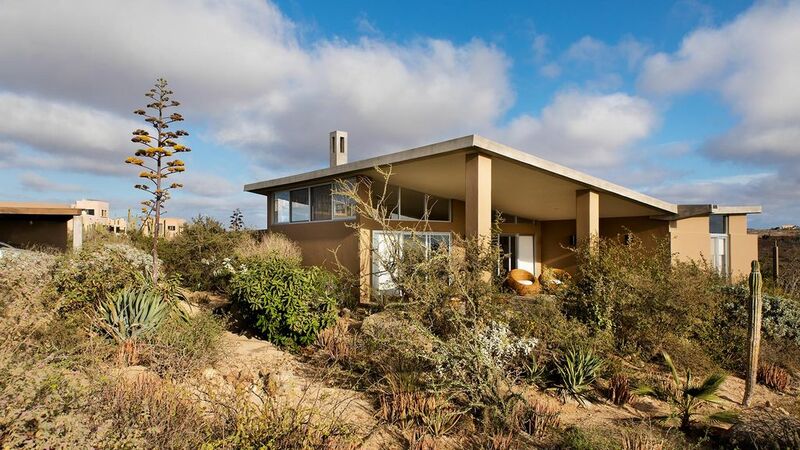 Casa Cascada est un 2 100 pieds carrés maison mexicain contemporain situé dans la ville balnéaire pittoresque de Todos Santos une courte une voiture de Cabo San Lucas, mais un monde à part. La maison de conception architecturale situé à 15 minutes au nord de la ville dans la région de Las Tunas dispose d'un plan d'étage ouvert complimenté par les portes et fenêtres qui encadrent des vues imprenables sur la Sierra Laguna montagnes à l'est et le Pacifique à l'Ouest de large. La maison est entourée par abondante aménagement paysager du désert et terrasses tranquilles pour la vie intérieure / extérieure facile. Chacune des chambres donnent sur la arroyo au sud avec son abondance d'oiseaux ainsi que le désert et la mer à l'est et à l'ouest. Achevé en début de l'été de 2010, Casa Cascada dispose de deux chambres / deux salles de bain, salon / salle à manger avec cheminée et une cuisine bien équipée avec des appareils modernes. La grande salle de bain principale dispose d'une baignoire et douche séparées ainsi que d'un double évier. Il ya une douche extérieure privée entre les deux chambres. Une terrasse sur le toit offre une vue spectaculaire sur le désert environnant et un bon point pour observer la vie de la mer, y compris la migration des baleines ou pour vérifier les conditions de surf si vous êtes si incliné Vantage. Un spot de surf de classe mondiale est de 3 minutes en voiture et la plage, avec elle lagon de saison à l'embouchure de l'arroyo, de cinq à 10 minutes à pied. Que vous souhaitiez explorer la ville historique de Todos Santos avec sa merveilleuse variété de restaurants, galeries d'art de renom et de yoga / classes de méditation, ou aventurez plus loin dans les montagnes ou la mer de Cortez Casa Cascada est un endroit idéal pour venir à la maison chaque jour après vos aventures de Baja. This house was exacty what we were looking for. The architecture and austere interior austere is serene, and allows a real appreciation of the sea, stars, desert and mountains. We loved the glass sliding doors that opened to the west/ocean view, and the outdoor kitchen on the east side where we could take in grapefruit-colored sunrises. My favorite feature was the outdoor shower on the south side of the house. The location offers quiet downtime from Todos Santos; all of the beaches we like were 15-20 minutes away. Spend a day in La Paz if yu get a chance and snorkel with VIP Tours for an unforgettable experience with whale sharks. Only 30 minutes from there is Balandra beach, which is perfect for families/kids. Our family enjoyed our stay in this lovely home in the las Tunas neighborhood. The one thing that would make it even better would be a pool since none of the nearby beaches are swimming beaches. It was a beautiful quiet place to come home to after exploring the old town & beaches and the sea of Cortes. We had a wonderful week long stay at this Todos Santos home. The house is beautifully designed with high ceilings, clean stone and cement interior, great light, and two separate porches as well as an outside eating area. The master and second bedroom are good sized and well-designed with comfortable beds, and the kitchen is well-equipped with major appliances, cookware and dishes. There is a clear view to the ocean in the front and the desert and mountains behind, with especially good views from the roof deck. The house is close to town but far enough away to get a bit of space, and a beautiful and uncrowded stretch of beach is just a 15 minute walk. Erik was an excellent host, met us in town to take us to the property and was available for any questions we had. We would definitely go back! very nice property. quiet beach/desert setting outside of town a short car ride north. well maintained, clean property - can't say we needed for anything. short walk from the beach - not a swimming beach. while strolling on the beach one afternoon, got a very entertaining show from a pod of humpbacks just 150 yards from shore. i would, most definitely, recommend this property. if you're looking for a quiet get away, todos santos is a delightful little fishing village, avoiding the big city tourist destination of cabos. and this property goes right along with the quiet get away. erik is the local contact, and is immensely helpful, friendly - even got us reservations at his excellent restaurant downtown on valentines day. thanks erik. I loved everything about this property!! This was just what I was looking for, off the beaten path but not too far, peaceful, quiet, relaxing and I didn't want to leave. Everything was perfect!